In the San Francisco Bay Area, it was station KRE in Berkeley that furnished a seven-day-a-week jazz menu, and kept jazz lovers up to date on the different artists. KRE was the station that first presented the Mills Brothers, who as a group of four brothers, sounded just like musical instruments. They were a national sensation, but we only heard them on the air. They never came to Northern California, but they did play in Los Angeles. Opportunities for blacks in radio were very limited in the 1920s and 1930s. The radio stations created their own celebrities. They had people who performed from the studio, and they didn't have to depend upon records. Most radio stations had a policy of not hiring black entertainers. 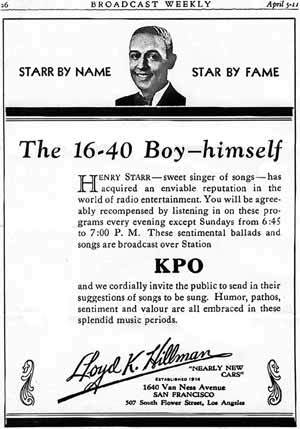 The first black entertainer to get on a radio show in San Francisco was Henry Starr, a fine Oakland-born musician. He had left Oakland in the 1920s to work in Los Angeles and on the East Coast as a piano player, with some of the very good black entertainers of that period. He was gone for a long time before he came back home. Then he was hired as a star of a variety show known as the Edna Fischer Show on KFRC in San Francisco. It became very popular. Thousands of listeners turned their radios on every morning, and the names of the stars were well-known locally. Starr sang and accompanied himself on the piano. Rumors were that he was paid $100 every week, which was a lot of money in 1929 for anyone. Houses then sold for less than $5000.